I just got an e-mail asking what the difference is between a sticker and a decal. 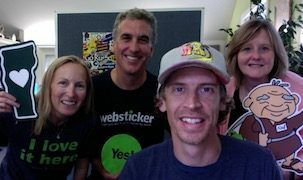 We often get this question at Websticker.com and I thought it was about time I tried to address it. There is no absolute answer as different people will often use the terms interchangeably to describe similar products. Looking for a definitive answer over at Yahoo Answers won’t help clarify differences: “decal is a more professional word for sticker”… No; “I would think of a sticker as say a white label and a decal as clear”… No; “Usually a sticker is paper, example an Avery label and not durable and a decal has a permanent adhesive and is more durable”… No, no, no! Let’s go to the New Oxford Dictionary and try to break it down. Then, I’ll let you know how we at Websticker (seller of custom stickers, decals, and labels) tend to define these product categories. sticker n. an adhesive label or notice, generally printed or illustrated. label n. a small piece of paper, fabric, plastic, or similar material attached to an object and giving information about it. decal n. a design prepared on special paper for transfer onto another surface such as glass, porcelain, or metal. As you can see, it’s fairly obvious why we also get asked the question; “what is the difference between a label and a sticker?” A sticker can be a type of label… and labels with an adhesive are also stickers. 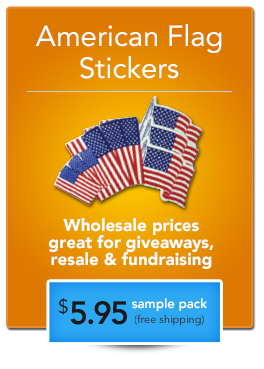 At Websticker.com we use the term “sticker”, as in “bumper sticker”, “die cut sticker”, “window sticker”, etc., to define more heavy-duty labels/stickers that can be used outdoors and hold up to the elements over an extended period of time. These are printed on a vinyl or polyester material with durable outdoor inks. We generally use the term “label” to describe adhesive products printed on papers or foils with inks not suitable for outdoors. “Address labels”, “shipping labels”, “lapel labels”, “foil seals”, etc., these tend to be supplied on a custom sticker roll or sheet for use (indoors) on packaging, paperwork, clothing, products, etc. The term, “decals” on the other hand, is often used interchangeably with other outdoor sticker products. But, as you can see in the New Oxford definition, “decals” are more associated with a “transfer” from one medium to another. “Decal” is short for “decalcomania” and usually is a more decorative type design. Thus “slide-on transfer decals” in the model building world, or water-slide ceramic decals (Transfers) for tile and ceramic uses are an accurate use of the decal term. Where the decal-or-sticker confusion usually lies stems from vinyl cut lettering and graphics. These are for long term outdoor use and are supplied with a pre-masking sheet, so upon application are transferred from one sheet/medium to another. Unlike a traditional “sticker” which is removed from its backing paper and stuck where-ever, these vinyl decals are being transferred (often in multiple pieces) from the masking sheet to a smooth surface. So, at Websticker (and many other companies) vinyl cut lettering and graphics are referred to as “decals” and all other one-piece, outdoor printed vinyl or clear polyester as “stickers”. Decals are a type of sticker, however, so you’ll hear and see the term “vinyl cut stickers” as well (like in this informative video on how vinyl cut decals are made). I hope that drawn out answer helps. It is always best, regardless of the terms you use, to tell a manufacturer exactly what you are trying to accomplish with this sticky medium and where you want the sticker/decal ultimately to be applied/stuck. What ever you are trying to label, decorate, or promote, if you want your name (or message, or graphic) to stick, Websticker can help clarify and design the best custom product to meet your needs. Spot on and a very comprehensive answer. A lot of people are confused about these terms and they take both as same whenever they go for a customized solution of indoor wall decoration. Both are used for almost the same purpose but they are different in terms of their usage and material. Usually, decals are the advanced form of stickers however, decals are more durable and long-lasting. There are also some different type of decals where Opaque Vinyl, Clear Vinyl, standard and matte lamination, etc. are popular. I must say that Jeff, you have differentiated both quite nicely and in a plain language! Cheers. Nice post! All decals are stickers but not all stickers are decals. A decal is basically a decorative sticker while a sticker are generally printed with some kind of information on it. I’m looking to put a sticker on a wall. I was thinking originally I should use a vinyl sticker, but I am worried it might ruin the paint. Would you recommend a bumper sticker instead as a cleaner/smoother application? Bumper stickers are also “vinyl stickers”. As far as ruining the paint, it’s more about the adhesive than the material. Just make sure you get something with a removable or ultra-removable adhesive. Will a die cut vinyl sticker be good to place on my cars window? Sure it will. Die cut vinyl stickers or die cut vinyl decals – just keep your sight lines clear. Do you think that a transparent sticker (already sticky with its own adhesive) with an image and words that is being made to adhere to a cloth surface should be called a “decal”? The intended use of this item is that it be able to stay on and withstand the many uses of the piece of fabric, while still having the possibility of being taken off without damaging the fabric. Do you think it best to call this item a sticker or a decal? I’d call that a sticker or a label, not a decal. Hi Jeff. I was looking for a decal or sticker to customize my macbook pro. When I couldn’t find something I liked, I thought “maybe I can make my own.” That’s when I felt the need to find out the difference between a decal and a sticker. Any suggestions on how I can make my own decal or sticker for a macbook? For a transfer decal you could ask a local sign shop or someone with a plotter. For a durable sticker I like Sticker You for a couple (page) of full color, die-cut stickers. Though it might not look it when you arrive at site, you can upload your own images and stickers – it is not just clip art options. I bought a wall sticker, I stuck all the bits to the wall and then tried to peel it but the ink doesn’t transfer to the wall! I’ve tried squeegee and everything but I don’t know if I’ve done it wrong or not as I removed the huge sticky bit it was covering and just peeled off the stickers, put them on the wall and expected them to transfer! Hi Cheyanne – It sounds like you bought a vinyl transfer decal and there is a problem with the adhesive (or the wall surface). I would guess the decal is now ruined from your application attempts. I would contact the company where you bought the decal and request a replacement or refund. And, double check that you went through proper application process. I have made a bumper sticker that I want to have printed, but the options are confusing and I want to make sure I choose the one that will be best at handling the outdoor elements . The sticker is 11″x3″ with a light blue background and black lettering. The default for printing is “decal”, but I have the option of having it printed on “clear vinyl instead of white” or “removable adhesive”. Which will be best for my car? Jo – It sounds like you are printing only one sticker, so there aren’t a lot of options. The digital printing will not be “the best” at handling outdoor elements. Cafe Press or Zazzle will hold up fine, beware of ordering from someone with a home set-up. It helps to be using black ink as that will last the longest without fading. Stay away from the clear material for this – with those colors it would disappear. Definitely get a “removable” adhesive. If you are interested in a larger quantity, let us know. 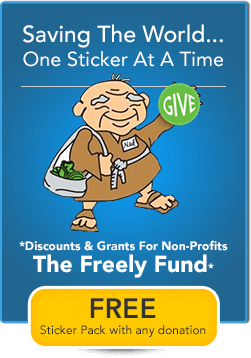 It sounds like you bought a sticker with ink printed on clear material (vinyl or polyester). This type of sticker is available with removable adhesive, but not in this case I guess. For the words to be left on the window, you would need a vinyl cut decal with a masking sheet. just need to find out difference between mirrokote sticker and car sticker. I just came here to inform myself on the definition of decal however I must say this is an amazingly and surprisingly good way to attract people to your web sight and business because if I ever need a bumper sticker i now know where to go. In the interest of recycling the rare earth magnets inside of spinning hard disk drives researchers at our national laboratory may need to remove the sticker on the back of the hard drives. Removing the sticker could facilitate automating the recycling process better that leaving it intact. I have something on my bmx which I want to take off and my friends say it is a sticker, but there is no way I can get a grip on the edges to be able to peel it off. It is as if it is part of the bmx frame. Does that mean it is a decal? And if so how would I be able to remove it? Sounds like a water slide decal and most likely a coating of something was put right over it to seal it onto the frame. I think you’re stuck with it unless you repaint or place a sticker over it. Hello, I am in a friendly argument in a group I am in and have a guy saying that 3M 1080 Carbon Fiber wrap is a sticker. I told him it is a decal not a sticker. Just wondered what you guys considered this to be? I’m not sure I would call it a sticker or a decal as it is more of a roll of adhesive vinyl material, or Vinyl Flex Wrap. Once applied in smaller customized pieces it really could be considered a decal or sticker. Sorry, not going to choose a side. I was given a “decal” to put on my car but was concerned it was a sticker that would be a pain to remove. I wanted to see how similar decal and sticker are. Both decals and stickers can have varying degrees of adhesion. But, for car stickers decals normally come with a more permanent adhesive and might be a bit more of a pain to get off due to multiple pieces. But, by adding some heat, really any sticker or decal can be removed smoothly (assuming it is vinyl and not a cheap laminated paper). Just came across the word decal, didn’t know what they were so googled it and found your page. Great explanation, thanks. I was interested in this as I’m one of those people who likes to use language correctly. I hate it when people talk about plugs and actually mean sockets and refer to 15 lbs of weight or two hours of time. Anyway, thank you for a very clear explanation … even if it did prove to me that my original guess was wrong! But I LOVE being proven wrong. It means I can be right next time! I was at a dinner reception when I butted into a conversation about ‘Fatheads’ and I explained it to someone who knew nothing of them as a big ol’ sticker. My brother corrected me adding it is in one way but it’s sort of more, to which I reiterated that it’s more so a decal. Such has brought me to look up the meanings of each to see if I made myself more incorrect or not, lol. Also, in your opinion, what would you consider a Fathead? Hey Alex – thanks for the thoughts… I’d definitely consider a Fathead a “big ol’ sticker”. More specifically, a vinyl wall sticker. Not, a decal. I am shopping for something to put of my vehicle to personalize it. I want something that will last but can be removed when needed. I thought, perhaps, that decal over sticker would indicate an easier and cleaner removal. The usage of the terms sticker, decal or label are in no way related to the degree of adhesion. Both stickers and labels are available with “permanent” as well as “removable” or “ultra-removable” options. Decals (or, the types of transfer decals we use the term for) on the other hand are usually more permanent as once they are transferred from masking sheet they are not usually intended to be easily removed. For vehicle graphics (decals or stickers) it is not too difficult regardless of adhesive to remove most vinyl with a bit of heat and a little effort. I saw a story on appleinsider that used the ‘decal’ for what looked like stickers (http://appleinsider.com/articles/15/03/26/apple-pay-decals-begin-arriving-with-supporting-merchants). So, wanted to know the difference between a decal and a sticker and your site was helpful. Notice that in the first sentence of that article they use the term “new decal stickers”. Just goes to show that the words/terms are really interchangeable these days. In the article they use both Apple decal and Apple sticker – guess they wanted to cover both keywords, but in my book these are “stickers”. Thanks for the link and observation. Please keep this page up! I’m an archivist and librarian and this is a good explanation of the differences between stickers, labels and decals. In a library setting, I suggest to patrons that they consult someone in the industry as to what something is. It’s always best to consult a professional than go on Yahoo Answers. In an archives setting, when I am describing items in a collection I need to use the appropriate term. For instance, I assumed a sticker in one of our collections was a decal. I was going to describe it as a decal in the finding aid, but double checked and found your site. With the added information it’s safe to call it a sticker over decal. Here is a very example between decals and stickers. I thought it would be nice to share. My name is Sheila Mathews and I am from India. I was wondering if you could make decals for me. I love vintage flowers, most especially roses. But I’m neither a designer, nor do I know how to make decals. The pictures available on the internet are grainy. Also there may be copy right issues. So if I should place an oder with you for making decals of large sized vintage roses and other flowers, what would it cost me? I am looking at sufficient numbers to make it worth your while but I do have a limited budget. I sure would appreciate a response. I am not actually needing to buy stickers, labels or decals but I just did a Google search for the definition of a decal because I was trying to buy a kitchen blackboard with the days pre-printed on it and found lots of them being described as decals. I have really enjoyed reading this Blog. Who needs text books or electronic games when such interesting and entertaining stuff can be found on the web? I have decided that my five-a-day will be five internet searches for spurious facts. Very good for the brain. Thanks for stopping by and keep exercising that brain. 5-a-day is a great idea. Chalkboard decals are a great option for right on the fridge or wall in the kitchen. Though, I would call them “stickers” not “decals”. We only make custom ones in bulk, but I’m sure someone must sell pre-printed calendar versions. Have a great day! Thank you for expressing your knowledge about decals. I founded and operated The Decal Factory for 30 years. I concur with your article. I have a blog written under Mr. Decal. The articles are mostly about decals, labels, screen-printing, flexography, and the technology of printing. If you would like to use my blog as a source, please feel free to do so, using my byline as the articles source. I’m in a band and we would like to add a ‘sticker’ of sorts to our merch table. I notice that the vinyl stickers are about double the cost of paper stickers. Now we are left with the question of which to choose? In your opinion do you believe that the vinyl decal would be over kill or a wise choice because of the many different applications? Without question I would always recommend vinyl stickers over paper for promotional purposes. They are way more desirable to fans and can be a merch item as well as giveaway. And the applications are much more extensive – guitar cases, equipment, skateboards, cars, bars… well worth the added price. Screen printed stickers are 3-5 years outdoors. This is your bands image you’re talking about, don’t go cheap! And make a cool design that further adds to desirability and spreads your identity. We’re happy to help if you need suggestions on improving design and making the sticker campaign as affordable as possible. Great this thing let me know about it.what i had already idea that stickers are sticky and decals are more transparent. This post let me know the real thing. I watched Orange County Choppers last night and Paul Jr was installing a large Vinyl Cut Decal on his new truck. With the large truck graphics it looks like even a talented guy like him can struggle. They took their time and after a couple of tries they finally got it on. Sometime you might want to write about how to install the larger graphics. What an excellent, comprehensive article! The item about choosing your type of sticker based on what you want it to do is sage advice–and it applies, by extension to your design, as well. What do you want your sticker design to actually DO? A tiny URL on a bumpersticker won't be visable in traffic–a giant size won't inspire people to put your sticker on their laptop…these examples all seem pretty self-explanatory, I know, but it's amazing how many designers miss the boat! 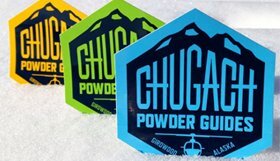 I have noticed that there is a geographic trend that determines whether people use decal instead of sticker when describing outdoor stickers. It is definitely used the most to describe vinyl cut stickers. We have also heard the term 'Deckal', clarified as a real word and not a mispronunciation a few times. Thanks for clarifying, Jeff. It can be confusing when everyone calls the same thing by a different name. It's nice to see how Websticker.com defines it's products so that everyone can communicate on the same level! I think a sticker and decal are the same thing. A label or lapel sticker would be paper. I am one of those people that pretty much calls everything a sticker. I was glad that when I contacted Websticker.com about promotional stickers I needed for a show they asked me what the sticker would be applied to and how it would be distributed. This saved me from buying paper labels that would not be the long lasting bumper stickers I needed.